Panzanella is an Italian salad dish that usually consists of lots of chunky vegetables (cooked or raw), croutons, and vinaigrette. The bread absorbs the vinaigrette and vegetable flavor. Panzanella is perfect for people who usually hate salad: it’s not full of lettuce, and let’s be honest – it’s all about the bread! It’s hearty, it’s healthy, it’s got lots of flavors and textures. 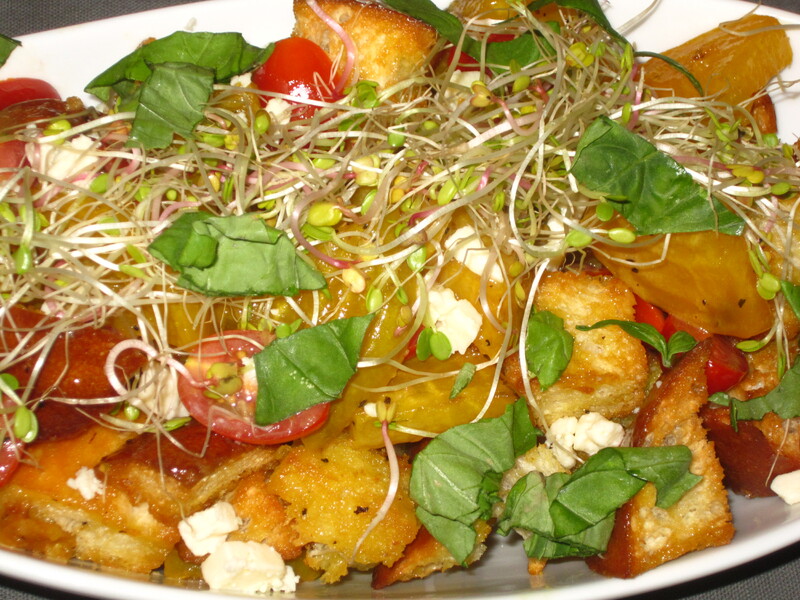 It’s also a hugely customizable dish; you can add whatever veggies you like with some croutons and you’ve got it. I like to cook in season, as I truly believe the Earth knows how to give us exactly what we need when we need it. Plus if you buy in season, it is usually cheaper and tastier than something shipped halfway around the world and sitting in a box for weeks. Beets are a springtime root veggie, which is why I am using them in this version. If you are familiar with reading recipes then you probably have seen this next to certain ingredients: (optional.) I never include this note, because almost every ingredient is optional! If you don’t like something, then skip or substitute. Same thing if you are short on something on the list. And if you want more or less of something, then do it! You’re cooking for you and your tribe, not me! Food is truly an expression of love, and how can you express it by serving something you don’t love? • 4 large golden beets. Beets have a texture and flavor similar to carrots but with more subtle flavor and sweetness. They also come in red or purple color. • 1/3 loaf crusty bread. Don’t use pre-sliced bread for this. Just buy a loaf of whatever sounds good to you. Or you can use up bread that’s gone stale. • ½ pint grape tomatoes. I prefer the grape tomatoes to the cherry ones. They have a much better flavor and fewer seeds. But you can also just dice up any tomato you have. Heirlooms would be fantastic in this! • 1c sprouts or watercress. I used sprouts this time (clover ones, which have some spice.) Micro greens or arugula would be also be delish! • 1/3c fresh basil or parsley. • Olive oil. Or use any other oil you like. Here is one place where I don’t recommend a substitution. Don’t use table salt! Kosher is the best everyday salt. It’s cheaper and also has a much softer, smoother flavor. A little does NOT go a long way, so it’s harder to over-do it. Salt’s true purpose is to bring out the flavor of the ingredients, not to make the dish taste salty – and that’s what kosher salt does in a nutshell. A vinaigrette is essentially 1 part acid and 2 parts oil. As long as you go by that ratio you are golden. • Juice of 1 fresh lemon. It is cheaper, healthier, and by far tastier to use real lemons instead of the bottled “juice”. • 2 tbsp. white balsamic vinegar. Has a much cleaner, astringent taste than the dark balsamic. It is closer to red wine or champagne vinegar. • 1 egg yolk. This will emulsify (thicken) the vinaigrette. Don’t let the egg yolk freak you out – you probably eat it in a lot more dressings than you know. If you can’t get over the raw yolk thing then use Dijon mustard for a similar effect. • 1/3 c extra virgin olive oil. This is a salad dressing – we are not cooking the oil. Because of that it needs to be the highest quality– flavorful and delicious right out of the bottle. I feel Extra Virgin Olive Oil is the best, and Trader Joe’s has very high quality options for very little money. • Kosher salt & black pepper. I don’t really like to give amounts for salt and pepper. I just add pinches until my food is coated appropriately. The kosher salt has a much more forgiving learning curve on the pinching method. I eyeball most of my measurements. If you are new to cooking, a good way to get an idea is to just leave out measuring cups and spoons. Look at the amount called for and eyeball about what you think would fit in said cup or spoon. Preheat oven to 400 degrees. This is the temp for both the beets and the bread. Peel the beets with a potato peeler and cut into slightly-larger-than-bite-size pieces. Place them all on a baking sheet and then drizzle lightly with olive oil. Sprinkle liberally with salt, pepper to your taste, then use your hands to mix it all up, making sure that all pieces are coated with oil but not dripping with it. Put into the oven and roast for 30 minutes. (If you ever want to speed up your cooking time on roasting vegetables, cut them into smaller pieces. If you cut them into ½ the size, you can shave 10 minutes off roasting time.) Roasting anything intensifies the flavor. It’s a great trick. And almost any vegetable cut into bite-size pieces will roast in about 30 minutes at 400 degrees. Just be sure to get the salt on BEFORE roasting. It’s important to season ALL the LAYERS of flavor! Once beets are in oven, peel the garlic clove and slice it in half. You can also just smash the clove with your knife or a glass bottom and the peel comes right off. Smashing the garlic releases all the juices, aroma, and flavor. I chose to leave the clove halved (or smashed) in this dish for a subtle background garlic flavor. If you want it stronger, go ahead and mince it or add more cloves. With garlic, the finer you mince it, the more flavor you will have. In a glass jar or Tupperware container, add in all vinaigrette ingredients. Put the lid on tight and SHAKE until everything is incorporated. (This part is a great job for the kids; my daughter loves to be the dressing shaker!) Set aside or put in the fridge. Next, cut the bread into slightly-larger-than-bite-size cubes. I like to do this by cutting thick slices and then cutting each slice in half vertically and then into cubes. Place on a baking sheet and drizzle with olive oil. Season lightly with the salt and pepper; then use hands to mix it all up, making sure that all pieces are coated lightly. Bake in the oven with the beets for about the last 10 – 12 minutes, turning over the cubes once with a spatula after about 5 minutes. When the croutons are golden brown all around, they are done! Once the beets and croutons are out of the oven, pour them into the salad bowl with the tomatoes. Add the vinaigrette and toss. I like to use a large slotted spoon to do this. If you have leftover vinaigrette then refrigerate for another salad! Add the sprouts and toss again, and sprinkle with basil and parsley. This salad actually keeps pretty good overnight in the fridge. The beets can also be roasted a few days ahead of time, but I would do the croutons right before because the heat helps them absorb the dressing. Don’t worry about it looking perfect. One of the best things about this salad is that it is chunky and easy. Don’t ruin the easy part by being stressed out! Thank you so much for reading my recipe! I hope you enjoyed it enough to try it! Here’s a printable version of this recipe without all the extra details: springtime panzanella. If you have questions or comments, feel free to email me at bradymunchblog@yahoo.com! For more of my recipes and delightful commentary (ha-ha!) please check out my blog BradyMunch! Looks yummy Erin…..but I want you to make it for me……please! Love you!